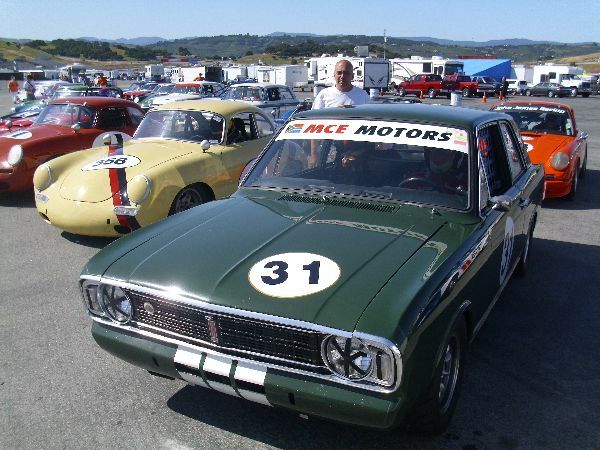 16 English Fords (Well actually 15... 16 if allowing a Kent-powered Capri certain latitude...) including Lotus Cortinas, Cortina GTs 2 Escorts and an Anglia, owners-without-their-cars and enthusiasts recently gathered in beautiful Spring-like weather at Laguna Seca's Mazda Raceway in sunny central California to celebrate and race. Mike Summers and John Ayton organized and arranged the 3-day April 29 through May 1 2011 event, held in conjunction with the San Francisco Region Sports Car Club of America (SFRSCCA) "vintage" race. 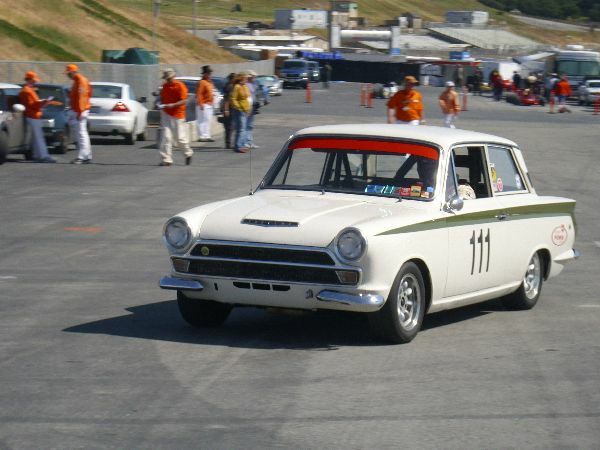 The Cortina contingent was the largest gathering of British Fords in the USA in years. A dinner was held at a nearby restaurant on Saturday night, attended by over 60 people. Sid Carr, former Team Lotus mechanic during the Lotus Cortina years of 1964-65 showed pictures from his personal photo album, supplemented with photos from another Team Lotus mechanic, Bob Cull (unfortunately, not in attendance). Peter Darley (not in attendance) also supplied a few of his images for the evening. 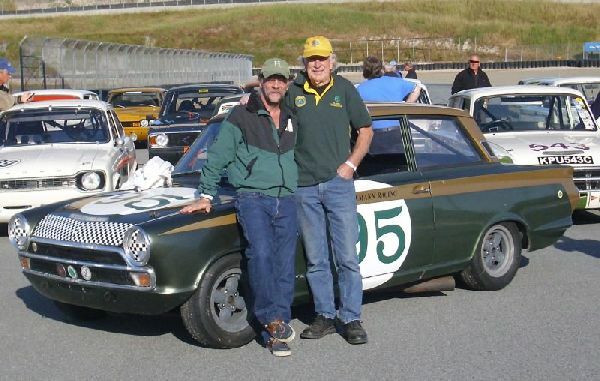 Bob Winkelmann, former Lotus Cortina builder and driver, also spoke, telling an incredible story of his adventure in the 1968 Baja 1000, finishing the race in an all-but-broken-apart Cortina GT. "Wink" also displayed (and drove!) 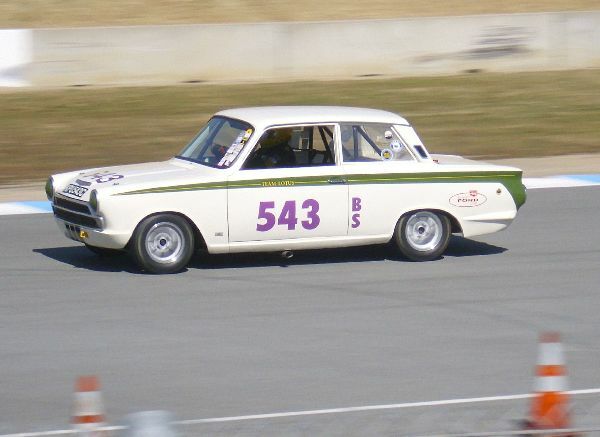 his former factory Lotus Cortina race-car, originally given in 1965 to Charlie Barns to race (VERY successfully), then sold to Don Gwynne for the same purpose, and then finally, to Bob Winkelmann, to restore and race. 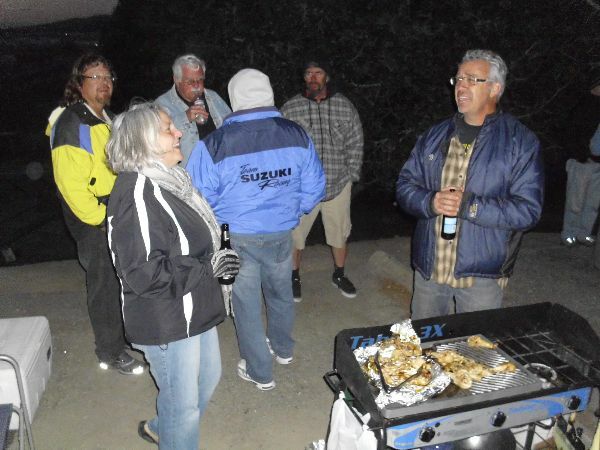 Other special events of the weekend included a Friday-night barbecue at a campsite overlooking the racetrack, a Saturday-morning set of parade laps at close to racing speed, and a Sunday-morning photo opportunity under the Laguna Seca arch bridge near Turn 3. LOTS of photographs were taken. Everyone in attendance appreciated Mike Summers' and John Ayton's organizational efforts! All photos below, by Bob Woolner EXCEPT for Turn3.jpg group photo. THAT photo is by Gary Kuntz. 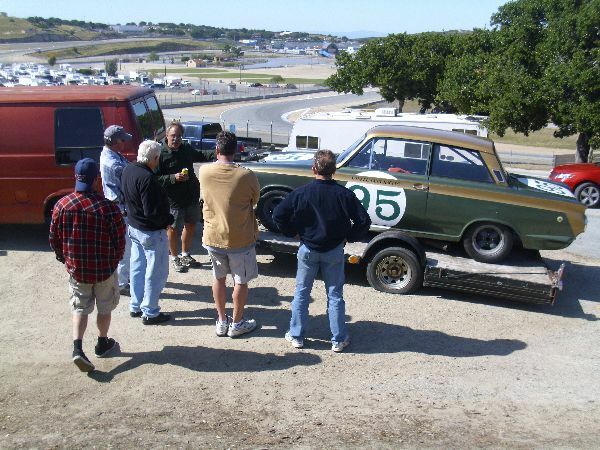 Phil Bass (facing camera) and others admire Bob Winkelmann's Lotus Cortina, soon after it arrived at Laguna Seca, on Friday afternoon at the Can-Am Circle campgrounds site, overlooking turn 5. Note the flat tire on the trailer- air had been leaking out of the tire during the long drive down from San Francisco, and the trailer had only JUST arrived at the track as the tire went completely flat. 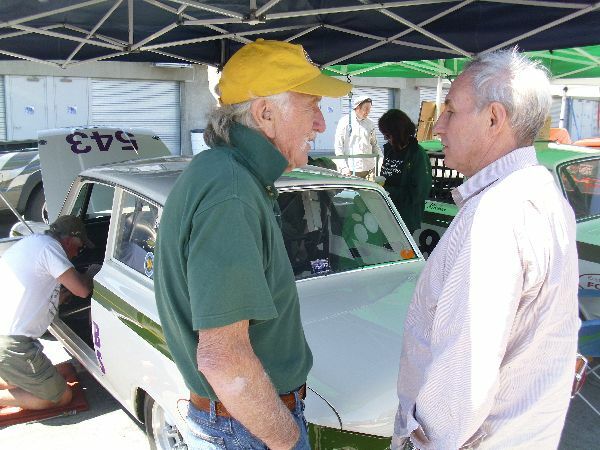 Nancy Summers, wife of Mike Summers (organizer of the weekend, and Lotus Cortina owner) laughs and talks with Lou Weinert, who drove down from San Francisco, but did not have his Lotus Cortina with him. (still undergoing restoration). Lou took LOTS of photographs... which we are still waiting to see... Lou? Are you reading this? Alan McColl, of Abbotsford, British Columbia sitting in his 1968 Lotus Cortina MKII at the start of practice on Saturday. Alan had a great practice session and race on Sunday finishing in 16th out of a very large field. Royce Miller in his 1966 Lotus Cortina racer, on the way out for practice on Saturday. 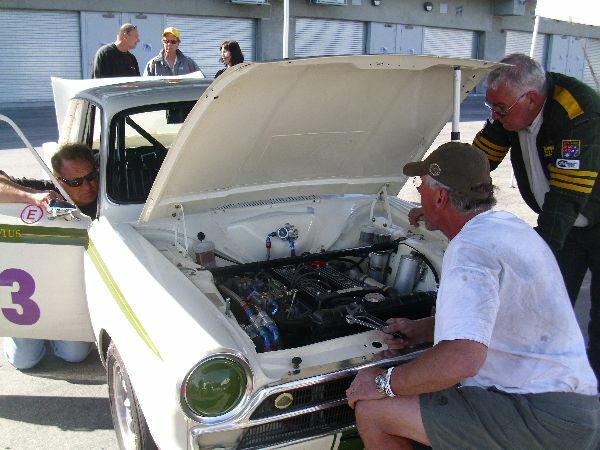 John Ayton turns on the fuel pump, while Mark Viscov and Roger Andriesse check the fuel pressure regulator on Roger's 1965 Lotus Cortina racer, formerly owned and driven by Ron Goldsack. Roger's car experienced all sorts of trouble ranging from fuel delivery issues to shifting problems on race day. Bob Winkelmann and Sid Carr discuss memories and details of the factory Lotus Cortinas of the 1960s. 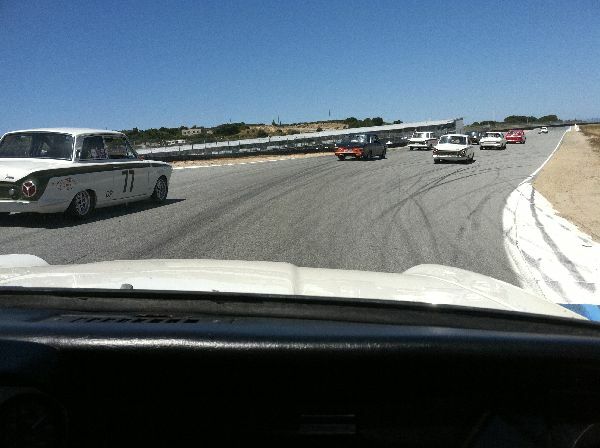 Roger Andriesse at speed, driving by the pits at Laguna Seca, on the straight between turns 10 and 11. 15 Engish Fords made it onto the track for 5 laps at near-to-racing-speed-but-with-no-passing on Saturday morning. Lewis Hahn stands by his immaculate 1966 Lotus Cortina during the photo opportunity under the tire-arch bridge. 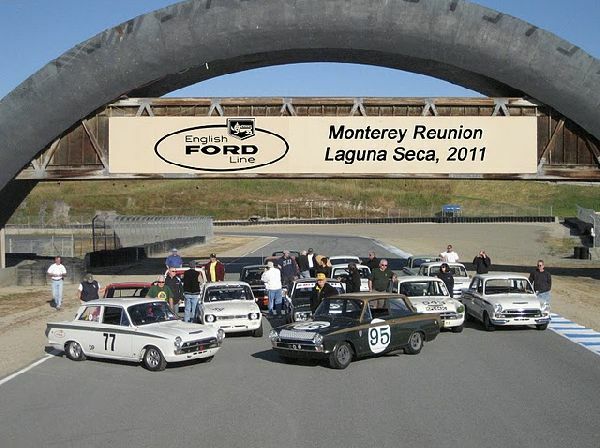 A photo opportunity on Sunday morning under the tire-arch bridge at Laguna Seca was appreciated by all. 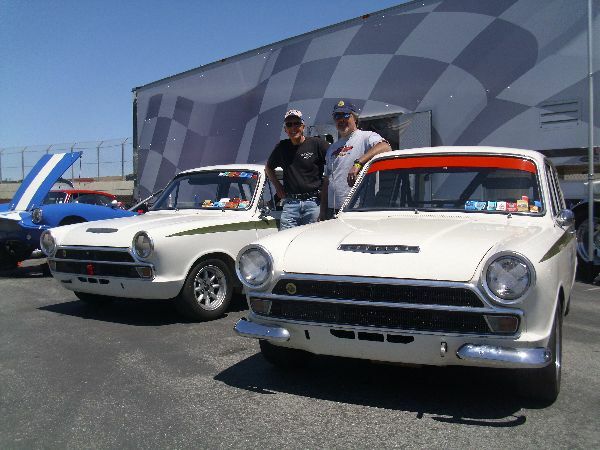 Bob Woolner and Bob Winkelmann stand by Wink's Lotus Cortina, in front of the assembled group. 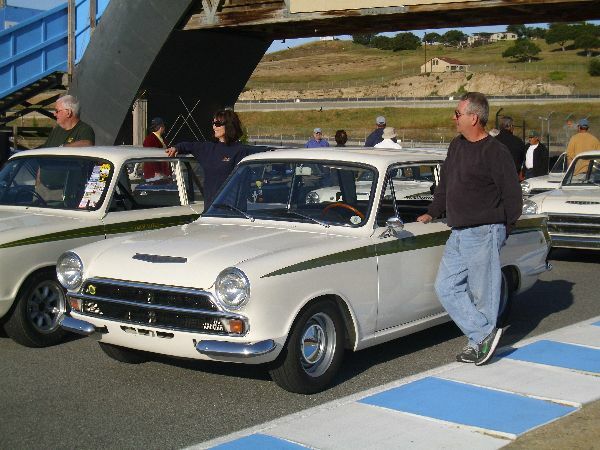 More photos of the weekend can be seen at: http://www.lotus-cortina.com/photos/westcoasttrip/laguna/laguna-pics.htm including a few sketches.